In addition to all of your loved ones who are laughing and enjoying each other's company, there are a few other items that must be present. The swimming pool is a given and so is the sound system that is playing everyone's favorite tunes. In addition to these items, there is one item that is needed in order to make sure that the ultimate summer experience is had. You guessed it.... the perfect grill. While many of us already own a grill that we use on occasions like this, it is high time that we took the time to consider all of the benefits that come with a much-needed upgrade. A number of advances have been made and you would be silly not to take full advantage of them. Did you know that you no longer have to purchase a grill and smoker separately? Or that grills now come with different sear zones that make for even easier cooking? These advancements allow for an even more immersive grilling experience and summertime just isn't the same without them. Once you have the chance to try out some of these awesome new grilling features for yourself, you will find yourself wondering how you could have possibly survived without for this long. These are the features that are going to allow you to take your cookout to the next level. Your friends and loved ones are sure to be grateful. Purchasing a grill with the newest bells and whistles is what will make your summer gatherings an event that everyone must attend. Thanks to the built-in lighting systems that are now available, you are no longer beholden to the inherent limits of the sunshine. Now, you can keep the party going for as long as you want or until everyone is finally full. 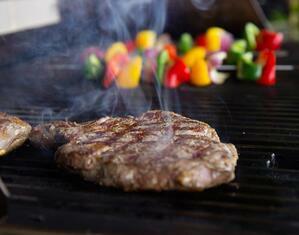 If you wish to create the ultimate summer experience for your guests, you are going to need the perfect grill as well. The perfect moment for an upgrade has arrived and thanks to the features that are available, you can choose the grill that is just for you.